So the first thing the book dismisses is the lack of competence within the enterprise to develop a technically competitive solution. Actually, it was usually the other way around — the very first prototypes of the solutions that would disrupt the market in the coming decade were often conceived within the very organisations toppled by those disruptive innovations. Those prototypes were usually demonstrated to the management and dismissed. Second, the concept of innovation is split into that of a disruptive innovation and a sustaining innovation. Both innovations change the way things are done today and render old solutions obsolete. However, a sustaining innovation represents an improvement (sometimes extraordinarily difficult) over a known technology (e.g. more TBs per drive platter, less diesel engine emissions etc. ), while a disruptive innovation represents an alternative way to solve a customer problem, sometimes even using a mediocre solution with subpar performance. And that is where the attention is drawn to the fact that organisational processes and values drive very good managers to take the decisions that make sense. Those decisions are to discard the disruptive technology that provides worse performance, has a smaller market and thus lower margins in favour of investing in the existing technology. The existing technology is in high demand by the key customers, and improvements to it promise great revenues. This is where the discussion of resource dependence starts. Turns out, managers (even including the CEO) who are able to see that an emerging technology is likely to be the next big thing within a decade are not able to fight the internal company process of investing into the most profitable projects. Another aspect is that for a publicly traded company, their shares are valued on the YoY revenue growth and the larger the company becomes, the smaller fraction of this needed growth a disruptive technology project can provide. The real problem is that in most fields a technology oversupply exists. 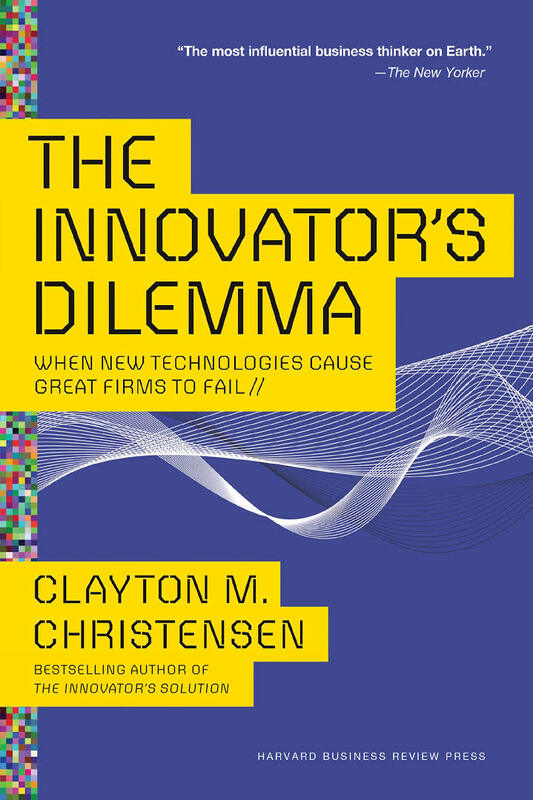 The book suggests that this and the emergence of the disruptive technology cause a change in the basis of competition. For example, a desktop user needs a hard drive. Companies compete hard to deliver a drive with a bigger capacity. At some point though, say, 1TB (in 2017) is plenty for most users and they are no longer excited twice as much over a 2TB drive. Instead, they want the size to reduce. Then, the speed to go up. The book explains that it causes the shadow prices for certain features to reduce dramatically, and it fundamentally affects the margins on the established products. One solution to this problem often employed by the enterprises is to move upmarket: keep making better products but sell them instead to richer customers ready to pay more. The book suggests that this strategy didn’t work for many companies who went out of business (e.g. manufacturers of 5.25” HDDs etc.). Instead, it is sometimes best to create a small organisation outside the parent enterprise to work on a disruptive technology, finding a new market for it in its current form in order to turn a profit far before it takes over the big market. The book concludes with an imaginary case study of evaluating how disruptive an electric vehicle (EV) could be for a typical manufacturer. Spoiler: in the late 90s, when the book was written, Prof. Christensen drew a figure showing how EV technology develops faster than the consumer demand for speed (limited by the law) and range until refueling/recharging (100 miles is what most people would need). Surprise surprise, EVs took 37% of the sales volume in 2016 in Norway.